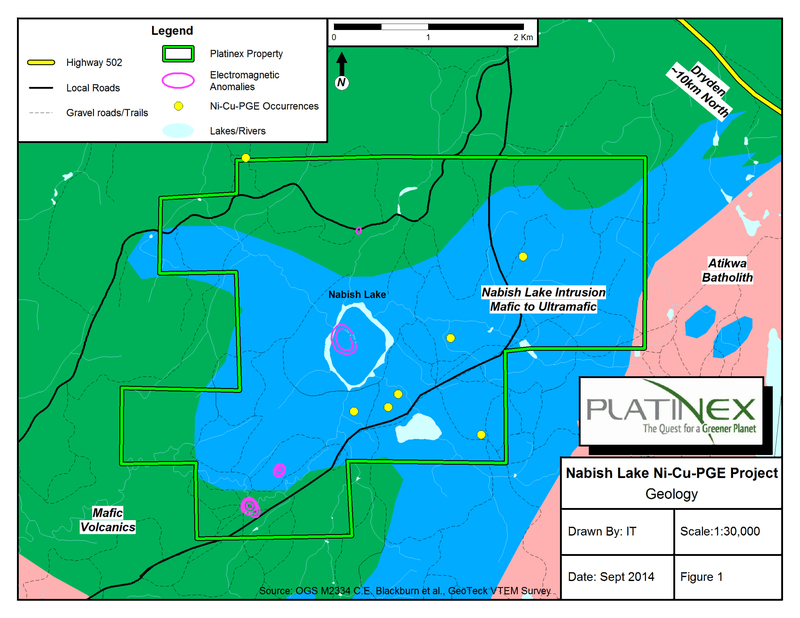 The Nabish Lake Ni-Cu-PGE property is located 20 kilometres south of the Town of Dryden, in the District of Kenora, Ontario, Canada. The property comprises 94 claim units (ten claims) covering 1,504 hectares (3,715 acres) of the Nabish Lake mafic intrusive complex. The intrusion is one of several mineralized mafic to ultramafic intrusive complexes that systematically ring the large Atikwa Batholith. Documents on record with the Ontario Ministry of Northern Development and Mines report samples collected on the property have returned values of up to 3.5% Ni, 6.5% Cu and anomalous levels of PGE. In addition, a recent airborne VTEM survey over a portion of the property has identified several unexplained geophysical conductors worthy of drill testing. From a regional perspective the juxtaposition of the mafic to ultramafic intrusions about the granitic intrusion is an attractive target for several reasons: since the intrusions were emplaced in close succession the mafic intrusions cooled slowly allowing for the formation of layered complexes and processes that concentrate PGEs; the symmetry is similar to major PGE bearing intrusions such as the Bushveld Complex, and; the combined volume of mafic magma is well over the threshold for formation of PGE deposits. The Nabish Lake Intrusion, by virtue of the known Ni-Cu-PGE mineralization demonstrably contains anomalous concentrations of these metals. However, the known showings appear to be localized deposits caused by the shocking of the intrusion during the molten stage by fragments of the intruded rock. Nevertheless, the feeder zone through which a large volume of magma circulated is theoretically the most likely area to find commercial concentrations of base metals and PGE. On the Nabish Lake project site, untested VTEM anomalies associated with a magnetic signature appear along the projection of a possible magma feeder zone and are deemed to be very attractive targets for the discovery of Ni-Cu-PGE deposits. A 1,500 m drilling program is planned to initially test the VTEM anomalies. Follow up drilling will be conducted contingent on results. The property is located on a local well maintained road with good access to all parts of the project site. Exploration services and other needed infrastructure are readily available in the Dryden area. The option was acquired for a payment of 200,000 shares of Platinex to be followed on or before Dec. 11, 2014 with an initial payment of $7,350. Subsequent optional payments totalling $63,000 with issuance of 600,000 common shares to be released over a four year period will vest Platinex with 100% interest in the property subject to a 1.5% NSR. Suite 807, 20 William Roe Blvd.